BAGHDAD -- Iraq's most senior Shiite cleric on Wednesday joined a chorus of Iraqi politicians and clerics criticizing recent statements by U.S. President Donald Trump in which he said U.S. troops should stay in Iraq to keep an eye on neighbouring Iran. 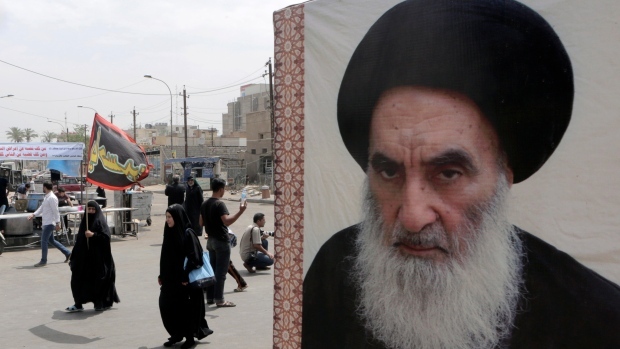 Grand Ayatollah Ali al-Sistani said Iraq aspires to have "good and balanced relations" with all of its neighbours "based on mutual interests and without intervention in internal affairs." Prime Minister Adel Abdul-Mahdi, at his weekly news conference late Tuesday, reminded Trump that there are no U.S. bases in Iraq and said he doesn't accept the idea of Iraq becoming an arena for fighting a neighbouring country. He called on Trump to retract his statements. Iraqi President Barham Saleh said Monday that Trump did not ask for permission to use Iraqi territory to monitor Iran and said the Iraqi constitution forbids the use of Iraq as a base to threaten the interests or security of neighbouring countries. Trump first said he wants to keep troops in Iraq as a base to strike at IS in Syria, then said the troops were needed to monitor Iraq -- comments that are likely to give momentum to opponents of the U.S. presence in Iraq.